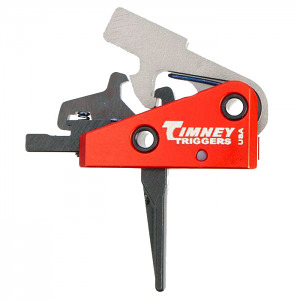 The Timney Triggers AR15 Targa 2-Stage Trigger features a very short first stage take-up and an exceptionally smooth, crisp, second-stage trigger pull. No gunsmithing, fitting, or adjusting required, the Targa is a self-contained, 100% drop-in unit that is ready to install in your AR-15. The pull weight is factory calibrated for a two-pound first stage and a two-pound second stage. The trigger housing is constructed of military grade, 6061 T6 alloy that is CNC machined and anodized for superior durability. The Timney AR Targa 2 Stage Trigger installs using your rifle’s original hammer/trigger pins. Made in the USA. Straight.